The 10-day workshop investigates structural computational design, where students are engaging debate with Roman engineer Sergio Musmeci’s idea of ‘form as unknown’. According to his methodologies the structural form is not a priori, of which you only verify the safety margins, but instead it is ‘deducted from an optimization of its static conditions’. The aim of the workshop is to develop parametric strategies which adapt form according to local site conditions and most importantly to social articulation of space usability. 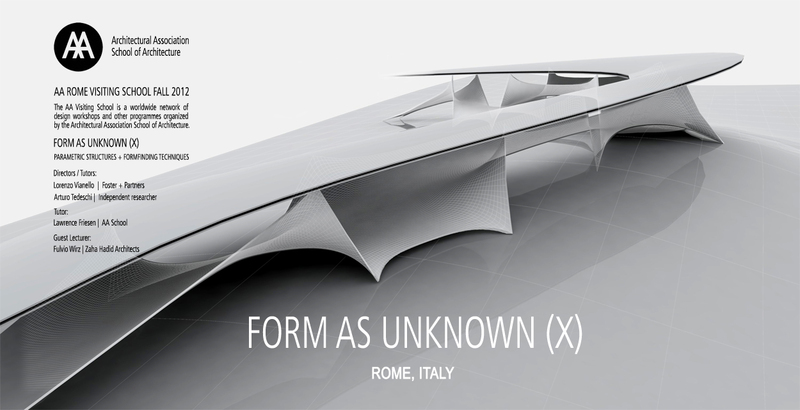 Once deployed on the site of Rome, these models will construct elegant context-specific structural, spatial and material organizations. The computational approach leads to discard the imposition of a prefixed form and instead create and use a performance driven procedure. On a team-based structure students will pursue their computational design researches coupling physical analogue experiments with algorithmic digital tooling. Finally digitally fabricated prototypes of their projects will be tested for real structural performances and richness of their tectonic articulation.